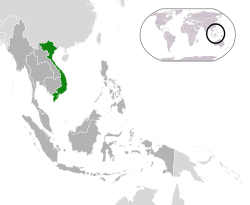 Map of Southeast Asia, showing Vietnam and its neighbors. ↑ Robbers, Gerhard (30 January 2007). Encyclopedia of world constitutions. Infobase Publishing. प॰ 1021. . http://books.google.com/books?id=M3A-xgf1yM4C&pg=PA1021. अन्तिम पहुँच मिति: 1 July 2011. ↑ ४.० ४.१ ४.२ ४.३ Vietnam. International Monetary Fund, September 2011 data. Retrieved 14 January 2012. ↑ "Vietnam’s per capita income to top $1,300" . Tuoi Tre News, 6 December 2011. Retrieved 15 January 2012.